Here comes the Christmas/Holiday season, and this is just the time for reading crime-themed mystery set at this time of year. Though the anthology is a mere five years old, and probably not forgotten, the contents are old, ranging from the 1890s to the 1970s. Take a look at the table of contents below to see what a rich cornucopia of stories is included. This wonderful, thick collection is a bargain and for those who don’t like to hold doorstop weight books is also available in Kindle/ebook format. 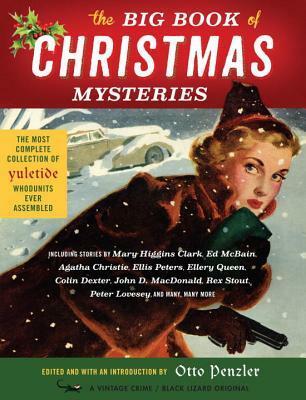 I easily enjoyed almost every one of these stories, many of which were new to me, and I’ve been reading Christmas crime anthologies for years. Speaking of which, I’ll admit I started this one last December, and didn’t get much past halfway, so I picked it up this November and finished it just this week. Good stuff. I just find these Penzler books too awkward to read. And I rarely find myself using my kindle anymore. Although he tends to have good taste in his selections. Steve, this is the very thing the Kindle is perfect for. Drop in to a short story collection, easy to hold and read. I have all of the big Penzler anthologies on kindle, and in print too. I’m tempted to fire up my Kindle and check out the Stout, Asimov, Allyn, Page and Mortimer stories. And maybe the Sherlockians. There are many good stories in this one. Penzler has been putting out anthologies that weigh more the Gramma’s fruitcake. This is one of the few I haven’t got…yet. That’s why it’s good they are available as ebooks. I’m getting the new one on female detectives in both print and Kindle for Christmas, so a little elf tells me. This one has been out a while, you might be able to find a used copy. This is a good one, I liked the inclusion of authors not commonly seen in anthologies like this one. By coincidence, George also reviews a giant Penzler collection this week. I agree, Jeff. This took me last year and this year to finish, but I enjoyed it all. Great minds think alike. My FFB today is THE BIG BOOK OF CHRISTMAS MYSTERIES, too. It’s a very good book, but awkward to hold while riding. I had to resort to putting on our dining room table to read. Yes, this is a good one, and I’ll bet the one you review, on female detectives, is just as good. See my comment to Jerry, above. I read a few of the stories from this book every December since I bought the book. I am maybe halfway through the book but I skipped around. I’m not a skip around anthology reader. Short of marking the table of contents, I can’t track of which stories I’ve read/haven’t read, and it feels chaotic. So I go straight through, and if I don’t like a story, I just go to the next one. I know most of the authors, but only 2 or 3 of the stories. I’ll have to dig out my copy of this one. I’ve neglected it far too long!